In last week’s dev diary, we talked about movement in Army General, as well as action points and how your battalions can use these. In this new Steel Division 2 dev diary, we’ll focus on that juicy next step, and what happens when two (or more) units go head-to-head. Glorious Combat! Mind you, we’ll talk more about the familiar real-time tactical battles on a later date. This time, it is all about the combat on a strategic level in our new turn-based dynamic campaign mode. Once more a disclaimer: what you are going to read and see is still in active development. Disregard any typos, glitches or baguette-language; this will all be fixed at launch. You know that battalions, your key units in Army General, have action points which you use to maneuver them on the campaign map. Once you encounter an enemy unit, and you want to engage them, you will need to have at least 3 action points (we will talk about this feature in more detail further below). As a player, you select the enemy unit you wish to target, and the option to do battle will appear, as well as the Battle Planner. Now, depending on which opposing battalion you have selected, the game will tell you which of your battalions will be able to support you, and in which battle phase they will appear if you do select them. That’s why maneuvering your units before the fight is so important: distance and location determine which units can be thrown in combat. As you know, the battle phases are listed as A, B or C, and displayed in big, fat letters above a unit on the campaign map. They correspond to the familiar battle phases you encounter in the real-time tactical battle. Taking into account distance, you can select a different enemy unit to see how the possible disposition of your forces will change. Enter the Battle Planner. 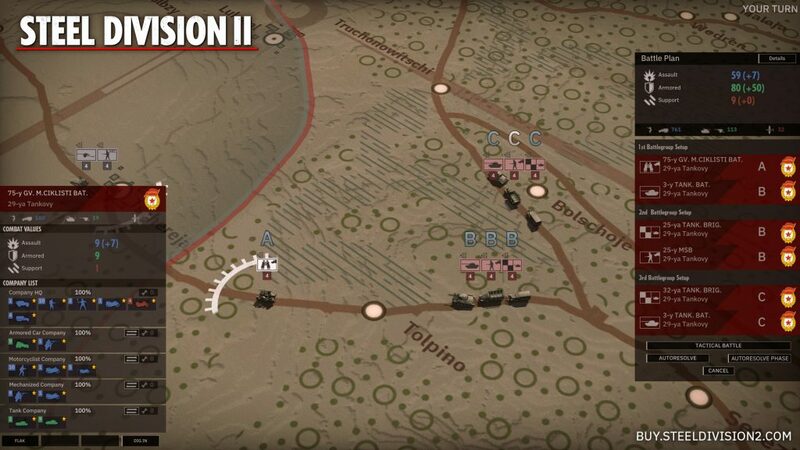 In this screen, you will see the slots of three different Battlegroups which are numbered as I, II or III. Each Battlegroup has space for two battalions. You will need at least one phase A battalion, in Battlegroup I, or else you won’t be able to engage in combat. You can bring one additional battalion to the fight, but if you want to bring more and unlock the next Battlegroup, you will need to bring an HQ battalion. The same applies for Battlegroup III. This way, in total, you can have two HQ battalions and four battalions. Depending on where your HQ battalion is, and which battle phase they will enter, its subordinate battalion will arrive at the same time. 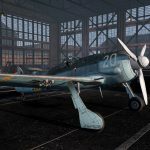 As we highlighted in the previous dev diary, planes, apart from being strategic assets which can limit air and ground movement (through artillery or arial denial), reduce the action points to zero (through a bombardment), or unveil enemy positions (through aerial recon), can also be employed on a tactical level and brought into a real-time battle with the help of an HQ battalion. HQ’s will also have other effects, especially during the tactical combat, but we will talk about this in a future diary. Remember when we mentioned needing 3 action points to start a battle? To be exact: a battalion will use an action point for each battle phase. This means that a unit with 2 action points can still arrive in phase B – if they are close enough – but only if there is at least one unit that can kick off the battle in phase A. 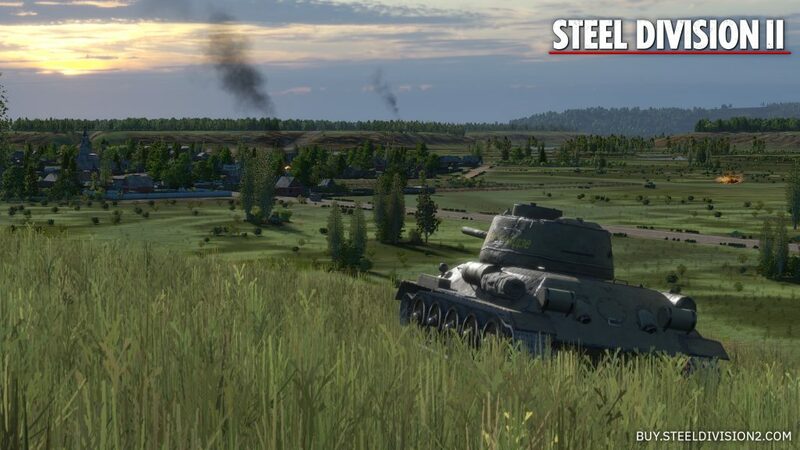 If you enter the real-time battle, the game will select a specific map depending on the location and where you are attacking from. So, if you find yourself deep in a forest, the tactical map will mirror this. 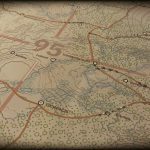 Your actions and location on the strategic map reflect the specific scenario of the tactical battle. For instance, you can have a classic conquest skirmish scenario if you advance one of your units against an opposing battalion that moved during the previous turn. Or, you enter in a closer combat scenario if both units didn’t move in their last turn. There is also a full breakthrough scenario (which we will talk more about in an upcoming dev diary) which occurs when one of the units is fortified! In each case you will have different starting positions, a number of flags or where the frontline is situated. That’s right, the new system from the Conquest mode will also be featured in Army General. In next week’s dev diary, we’ll reveal something cool. Like very cool. Something you guys asked for since the game’s announcement. 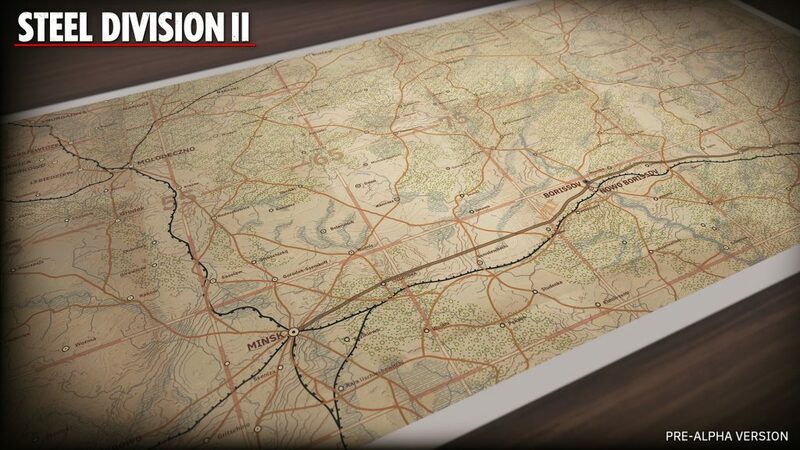 Don’t forget to check out the Steel Division 2 newsletter, wishlist the game, and visit our pre-order store. See you next week!